A few weeks ago while on a trip to visit family in Utah, I made a pretty spectacular and magical purchase. No, this particular purchase was not at IKEA. Although to be frank, I went there too and there were many purchases made in the store-where-dreams-come-true. While fabulous, they weren't spectacular nor magical. My SIL, who knows I like to cook/bake/eat/eat some more let me know about this family owned business that sold Mexican vanilla. 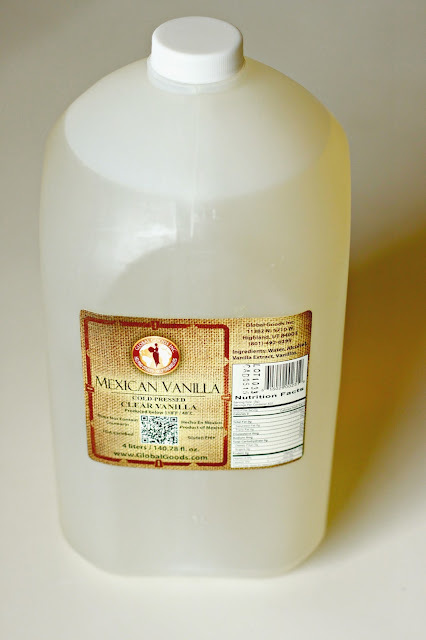 But not just any Mexican vanilla...CLEAR Mexican vanilla. I don't know about you, but I didn't even know such a thing existed. Being that I like Vanilla anything a whole lotta bunches (that was totally proper English), I agreed with her that we needed to hop in the car and both go purchase ourselves a giant thing of Mexican vanilla. AND I mean a giant thing of vanilla...FOUR LITERS. The crazy thing is, once I got home I found myself being very particular about what I used my precious clear Mexican vanilla for. I actually didn't bake with it for awhile. I wanted to use it for the most perfectly perfect recipe. 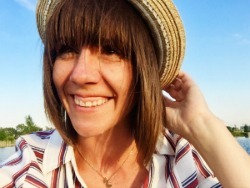 Well hello there Perfectly Perfect. And what might your name be?? 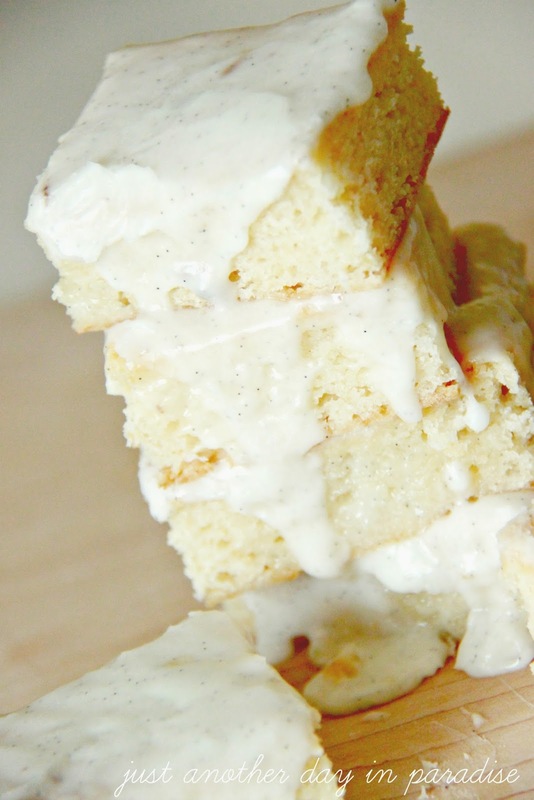 Oh Vanilla Bean Glazed Vanilla Cake Bars, well it is nice to eat...er uh, I mean meet you. When I first came across this recipe, it was actually called a Vanilla Brownie. Alas, they just weren't the consistency of a brownie, so I didn't feel grand about calling them such...you know since I have a love affair with brownies several times a month. I also thought that they needed much more vanilla than called for. I mean, hello, more vanilla equals love. Oh, and plus I had more than enough vanilla to use a little more. While I opted to call these cake bars, they are denser than regular cake. They are almost pound cake consistency. 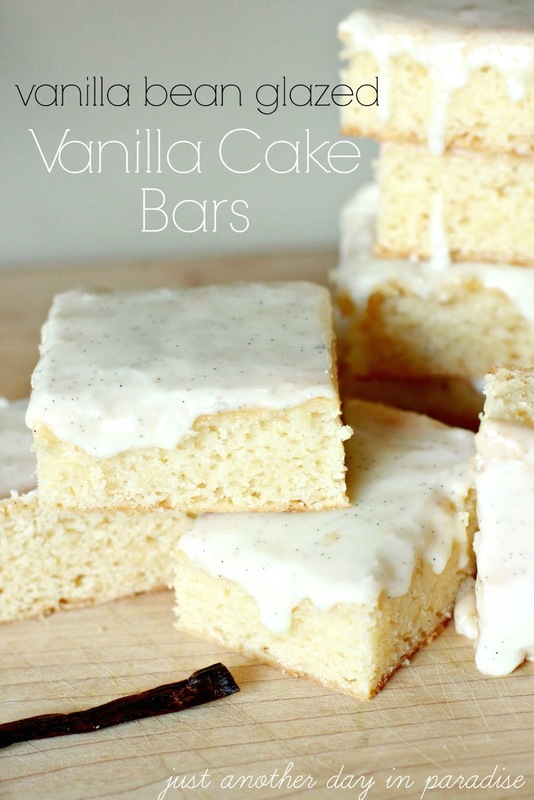 Dense, soft, vanilla infused bars, that is what they are. 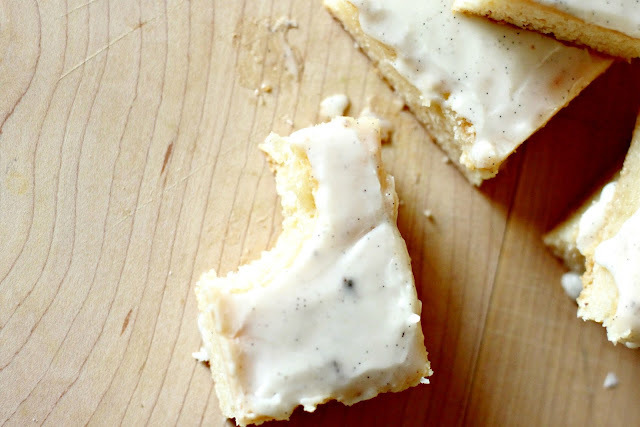 Basically all you really need to know is they are vanilla bars topped with vanilla bean glaze AND they are fantastic. These bars are dreamy. This vanilla is dreamy. Dreamy, dreamy, dreamy. "Well whatever shall I do, I don't have clear Mexican vanilla AND now all I want is to make some of those bars. My day is pretty much ruined. Ruined I tell you!" If you find yourself some clear Mexican vanilla, SUPER. If not, your hopes and aspirations of baking these scrumptious bars are not dashed. Bake them anyway. They will still rock your world. adapted from Oh Bite It. Mix the cake ingredients in a bowl until combined. Pour into a greased 9x9 baking dish. Bake for 20-25 minutes until the bars are set. While the bars or baking, make the glaze. Scrape the vanilla bean and put all the glorious scrapings in a bowl. Add in the powdered sugar, and start adding in the cream/milk 1 Tablespoon at a time. Stirring in between Tablespoons. Stop when it is a thick glaze, but thin enough to drizzle. Drizzle the glaze over the done bars. Those look SO TASTY Larissa! So glad baking season (aka fall) is on it's way. Must try. Angela, I hope you love them!! This looks fantastic! And where, oh where, might one find clear Mexican vanilla here in Utah???? ?